The first week of May we headed to Florida for our first ever family of 5 vacation. We rented a house on Miramar Beach (which was beautiful), and spent the week playing in the ocean and pool, and exploring the Destin area. Every parent knows a family vacation with little kiddos isn't likely to be super relaxing, but in spite of a few meltdowns along the way it was more than worth it. On our way to Florida we split the 12 hour drive into 2 days and stayed the night in Memphis. We'll likely NEVER do that again because it just made for 2 very long days! When we made the trip home we'd planned on just driving all day, but then on a whim we decided to leave the evening before and drive overnight (instead of leaving the following morning). This was the best decision ever and we will DEFINITELY do this next time! We ended up leaving around 8:30pm and arrived home at 10:30 - we made amazing time since the kiddos slept nearly the entire drive. This was much easier than trying to entertain 3 kids for 12+ hours. During the (loooong) drive home I put together a little video recap of the trip. The boys love to see themselves on TV so I didn't do a lot of cropping - it's 15 minutes long! I've been trying to take more video clips because hearing their little voices is the sweetest sound this mama can think of. While the trip had its share of rough patches, we've only been away from the beach for 3 days and the boys are ready to go back - so I'd call the vacation a success! We loved the HUGE Scout beach bag and Palm Beach blanket. Beach bags: I bought two of the Scout Deano beach bags off Amazon and these things were awesome. One bag is big enough to hold 5 beach towels, some sunscreen and still have a extra room to throw in random little things. Having 2 was great so we had somewhere for clothes, shoes and beach toys as well. 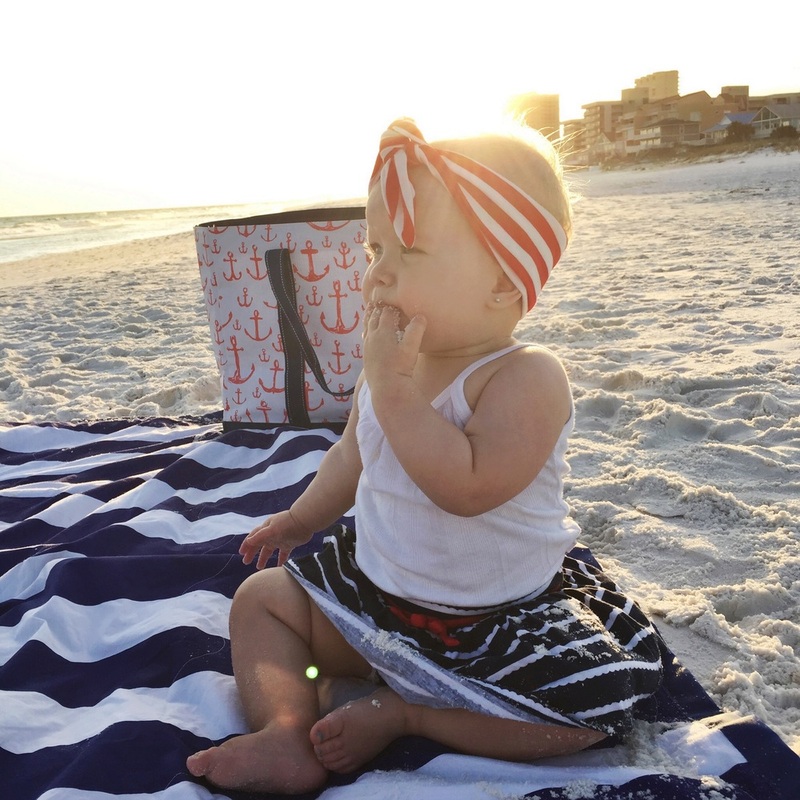 Beach blanket: I found this Palm Beach Crew blanket of Amazon and it worked out great. In addition to being easy to roll up and carry, the corners have removable weights and it came with a waterproof bag we used for phones, wallets etc at the beach. Sand toys: I also bought these from Amazon, and they worked great because everything fit nicely back into the storage bag. There were a lot of different highly reviewed sets on Amazon, but this set worked well outside of the boys fighting over the shovel. Ha! They also liked blowing bubbles on the beach. Swimwear: I found the cutest swimwear for the boys from Mini Boden (I always love their retro shorty shorts) and waterproof Native shoes from Nordstrom. These shoes are the BEST for summer. I found most of Sylvie's swimwear from Gymboree and Janie and Jack. My suits I mostly found at Dillard's in late August (for my birthday - actual birthday suits, haha) and they were on super sale. So if you can plan ahead, buying swimwear in August is the way to go! 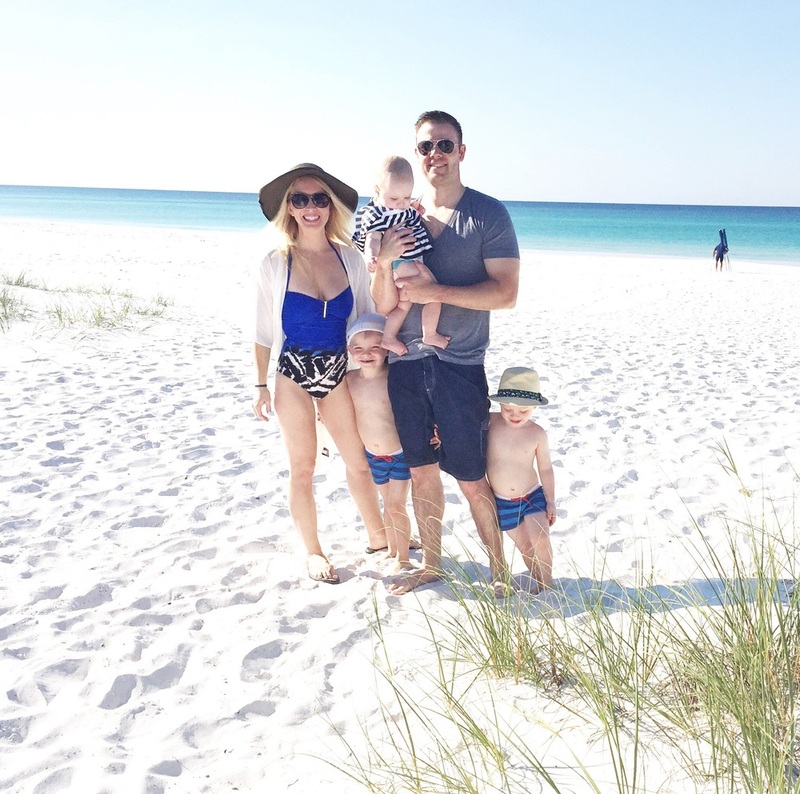 My parents bought the kiddos hooded beach wraps from Pottery Barn Kids and they loved them! These towels are so thick and cozy and the hoods help keep them in place. Sunscreen: Obviously you can find sunscreen anywhere, and being a very fair skinned family I'm proud to say we made it through the entire sunny trip without a single sunburn! But applying sunscreen to kids is THE WORST! I found using the cheapest, biggest sunscreen spray on the boys bodies, followed by lotion & suscreen sticks on their faces and ears worked great. This kept it from taking too long, but ensured they were safe. For Sylvie I applied ThinkBaby lotion to her entire body every morning when I dressed her, then again on here arms, legs, face and head when at the beach.